Proteins not only act as enzymes but also as enablers of other biological molecules’ function. Single stranded DNA binding protein (SSB) protein is one such protein universally present in all forms of life and acts as the key defender of single stranded DNA. Usually present as a double stranded helical structure, DNA must be peeled open into single strands for many vital cellular processes such as duplication of DNA genome. Single stranded DNA is highly susceptible to damage in the cell and is protected by SSB proteins. University of Illinois Physics professor Taekjip Ha and his former graduate student, Rahul Roy in collaboration with Timothy Lohman's laboratory at Washington University at St. Louis applied advanced single molecule fluorescence techniques to reveal remarkable motions of SSB on DNA. In a recent article reported in journal Nature (Nature 461(7267):1092-7 (2009)), they discovered that SSB that was long thought to be static when bound to DNA was actually roaming rapdidly all over the DNA. Furthermore, SSB could act as a 'molecular road roller' by removing kinks, so called secondary structures, that are spontaneously formed by the DNA. This function was biologically important because RecA proteins that are necessary for DNA repair could bind to the single stranded DNA only when SSB would remove such obstacles. 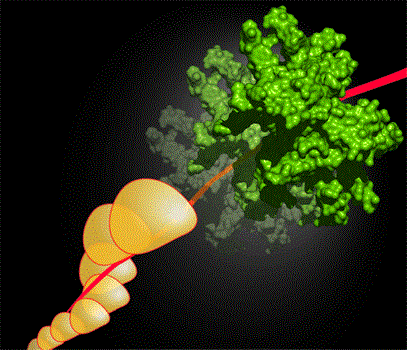 An artist’s rendition of SSB (green) in motion on DNA (red) followed by RecA (yellow) proteins forming a filament is shown in the Figure above. Read more about this study at HHMI and UIUC website.